NACC Alicudi is reported to be the world’s first cement carrier equipped with IMO Tier III compliant diesel engines driving the bulk handling system. 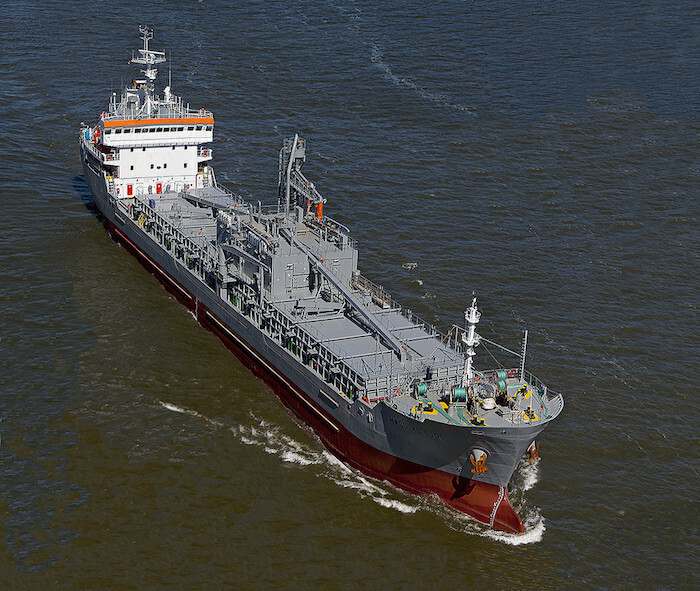 Converted in 2017 with a Van Aalst dry bulk handling system, the vessel became a unique and state-of-the-art 120m self-discharging cement carrier, with a cement handling system is based on compressors and vacuum pumps, driven by Tier III Scania engines. Together they form the heart of the unique vacuum-pressure system for pneumatic conveyance of cement, fly ash and granulated slag, as applied in over a dozen of vessels in recent years. The development of the world’s first Scania IMO tier III diesel engines in service has been the fruit of extensive joint engineering of Van Aalst, based in Dordrecht, the Netherlands, and Scania from Sweden. The challenge put forward was to find correct placing of the Scania Selective Catalytic Reduction (SCR) system in the engine room deckhouse, which was smaller as the previous non-SCR equipped engine room deckhouse. This resulted into lowering emissions, but also, and very important for the cement carrier owner, the lowering of the height of the loading system and loading points on board the vessel. This has considerable advantages during her operational life, as she can serve an increased number of ports. Directly after completion of the conversion, the NACC Alicudi entered the trade for a three year contract on the east coast of the U.S. and Canada, an area that is a NOx Emission Control Area (ECA) for new built and converted vessels as from January 2016. This approach fits well with the (environmental) policies of both NovaAlgoma Cement Carriers and McInnis Cement. The new McInnis cement plant in Port-Daniel-Gascons, Quebec, is state-of-the-art, in every way, and so is the new receiving Bronx terminal in New York. The high emission standards of the vessel will enable a shift to the U.S. Gulf of Mexico, Puerto Rico and Hawaii.